In this article we consider the “gains” and “losses” sustained by retirement plans of different designs, based on the performance of the asset and interest rate markets in 2018. 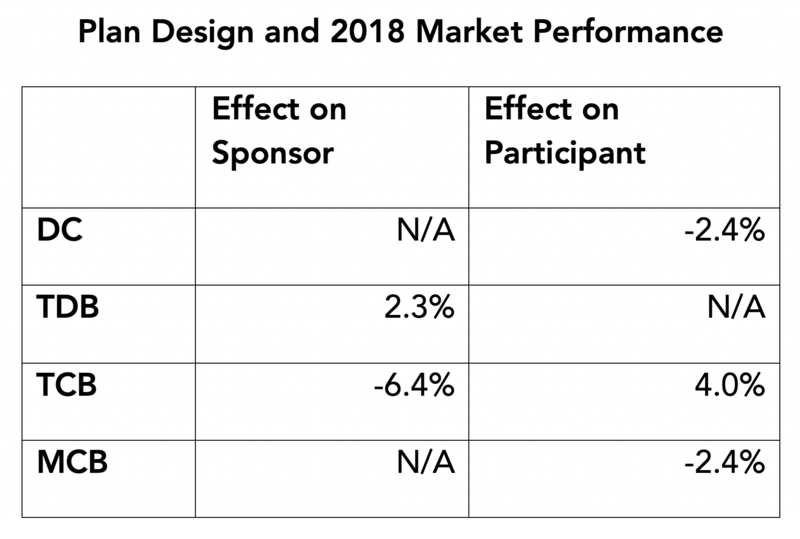 How, and in what different ways, did 2018 market performance affect participants in and sponsors of these plans? We consider four different basic plan designs: defined contribution, traditional defined benefit, traditional cash balance, and market cash balance. We assume a 60/40 equity/bond asset allocation for each. In the DB plans (traditional defined benefit, traditional cash balance and market cash balance) assets equal liabilities at the beginning of 2018. The sponsor gain/loss for traditional defined benefit and traditional cash balance plans measures the change in funded percentage as of the end of 2018. The participant loss in defined contribution and market cash balance plans is simply the asset performance loss for the year based on a 60/40 portfolio. The participant gain in the traditional cash balance plan is a function of our assumed 4% interest crediting rate. In all cases we disregard accruals, contributions, payouts, etc. for 2018. As the table shows, in 2018 traditional defined benefit plans did best and traditional cash balance plans – employing a “beat the bogey” investment strategy that requires plan investments to earn more than the plan’s interest crediting rate – did worst. This 2018 market performance brings into relief the risks inherent in traditional cash balance plan finance. Prior to 2018, there were nine straight years of positive S&P 500 performance. Over that same period interest rates trended steadily down. The result was positive performance for TCB and negative performance for TDB. In 2018, those results reversed. In contrast, market cash balance plans function like DC plans, generating (in our example for 2018) a 2.4% participant loss. An unusual feature of cash balance plan economics is that there is no market hedge for traditional cash balance plan risk. The only true hedge is through design – linking the investment crediting rate to plan portfolio performance, i.e., a market cash balance plan. Obviously, you don’t make strategic decisions based on one year’s performance. But you also don’t assume that the future will always be like the past. TCB sponsors will want to consider the long-run future risks presented by the “beat the bogey” strategy, especially if they are considering settling a significant amount of plan liabilities in the near future. What follows is a more detailed discussion of these conclusions. 2018 was a less-than-stellar year for assets. The S&P 500 lost 4.4% on the year, and the Bloomberg Barclays US Aggregate Bond Index was basically flat, earning a total return of 0.6% for 2018. Interest rates went up. A typical traditional DB plan saw its discount rate increase about 70 bps, from 3.6% to 4.3%, translating to a reduction in liability of 4.7% during 2018. DC plans: We only reflect the performance of assets. Traditional DB: Asset performance is netted against “liability performance” driven by the change in interest rates during 2018. Note we assume the plan is 100% funded at the beginning of 2018. Traditional CB plans: We assume total account balances equal to plan assets at the beginning of 2018. Account balances grow at the plan’s interest crediting rate, which we assume to be 4%. Market CB plans: Market cash balance plans use an interest crediting rate that is equal to the rate of return on plan assets or on a regulated investment company. This sort of design was authorized by the Pension Protection Act and in follow-on regulations finalized by IRS in 2014. For purposes of the analysis in this article, we use the rate of return on plan assets. As with DC plans, for market cash balance plans we only reflect the performance of assets. DC plans are account-based plans, in which the benefit is equal to the amount in the participant’s account and in which participants bear all the risk. Thus, 2018 market performance has no effect (“NA”) on DC sponsors and the 2018 loss to participants is simply the market loss. In contrast, in DB plans, the sponsor (generally) bears all the risk. A traditional DB plan defines the benefit (generally an annuity beginning at normal retirement age) pursuant to a plan formula. As a consequence (and again in contrast to a DC plan), plan performance reflects the performance of the plan’s liability portfolio as well as its asset portfolio. The “performance” of TDB liabilities is similar to a bond portfolio, reflecting: (1) changes in interest rates used to present value plan liabilities (driven by changes in market interest rates); and (2) a charge for one year’s interest on plan liabilities (reflecting the fact that those liabilities are one year closer to being paid). Because the funded status of a TDB is affected by both asset and liability performance, when rates go down, a plan can become less well funded, even if asset performance is positive. In 2018 we saw the reverse of this – even though asset performance was negative, increases in interest rates resulted in a net improvement (of 2.3%) in plan funding. Many employers sponsor cash balance plans, most of which provide “earnings” on cash balance accounts (called the “interest crediting rate” or ICR) at a flat rate (or a long-bond index with a minimum flat rate); generally that rate is between 3-5%. For these plans, benefits grow at the stated rate, regardless of what happens to plan assets. Because the benefit in a cash balance plan is (generally) defined as the balance in the participant’s cash balance “account” (pay credits + interest rate credits), the value of benefits is stable and not sensitive to changes in interest rates, unlike TDB plans. The cash balance benefit promise (a pay credit + a flat rate ICR) generally cannot be hedged, so assets are typically invested in a portfolio with the objective of earning more than the plan’s crediting rate. Hence our assumption that, like the other designs we consider, our example plan has a 60/40 equity/bond asset allocation. As our numbers indicate, that strategy did not work in 2018. In our example plan, the participants get a 4% interest credit to their accounts for 2018, increasing plan liabilities by 4%. The plan loses 2.4% on its 60/40 asset portfolio. The net “loss” to the sponsor is thus 6.4%. The foregoing analysis reflects what happened in 2018 in the real world. For DC plans, real world, funding and accounting are all generally the same. For DB and CB plans they are not. For TDB plans, ERISA minimum funding rules generally allow sponsors to use interest rates that are higher than market rates. Accounting rules “buffer” the effects of interest rate changes and asset performance on the income statement, but the impact of 2018 experience will show up on the balance sheet. The issue for CB plans is more complicated, because both for funding and accounting CB liabilities are not measured as the account balance. Ultimately, however, the real world will assert itself: if our example TCB plan were to be settled now, any real world funding shortfall – not the accounting shortfall – would have to be funded in full. Looking at plan design this way – considering its effect on the plan’s “financial performance” – produces interesting results, revealing consequences that are not always obvious when design is simply considered in the abstract. Sponsors will want to keep these consequences in mind when considering alternative designs. Want to receive the latest articles?